Friday brought a funeral for a co-workers son. Third funeral this month. So much for sping renewal. After that I just wanted to get out and appreciate life. I got home, changed, and took off on the chi-chi bike. 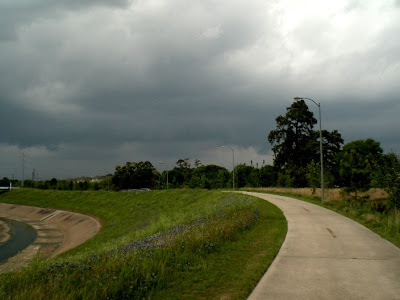 The clouds were looking ominous, but I kept going. Soon after that pic, it began to rain. It felt strangely good. Symbolic perhaps? Saturday brought sunshine and work on the MR2. I hit it with the buffer and wasn't happy with the results. There were lots of dirt nibs left. I considered just living with them. I didn't want to reshoot. I didn't want to sand them out, risking a burn through the clearcoat either. The would require a respray, too. My buddy Mason pointed out there was no reason not to go for it. The worst result would be to repaint just the hood - not so big of a deal. If it worked well, the entire car would look better. Here is the hood after wet-sanding out the dirt nibs with 800 > 1000 > 1200 grit. Very dull, but very flat. Mason was right. No burn throughs and almost all of the defectos were gone. The PPG Brand DCU 2021 clearcoat I used is veeeery hard! I'm impressed. It doesn't hurt that I have 4 or 5 coats either. Next came the cutting compound and buffer. I'm using 3M Extra Cut Compound. It works wonderfully well!! I highly recommend it, but beware it is veeerrry expensive... This stuff works like magic. Just a couple of minutes of buffing and the shine just jumps out. Only this time without (as many) defects. My biggest worry was hooking an edge with the buffer and ripping off the clear. I tested an edge of the door-handle-hole. Since it lies under the door handle, it wouldn't show. I ground with the buffer and compound and never broke through the clear! No worries there! The DCU is very, very hard! Puppy was excited about the results, as you can see! I'm both pleased and relieved. The buffing goes much faster than I thought it would. I'm surprised I didn't burn through while wet-sanding or buffing. I held off paining the bumper covers "just in case" I burned through anywhere. That way, I could re-shoot any screw-ups without another setup. No worries now. One step closer to done! This is a scheduled rest week. I'll be doing some testing, and working on the car.